Contact – Let’s grow your exports ! An image is worth a thousand words, and this is all the more true in business communication. And the rise of video is a perfect illustration of this. But e-mail marketing is one of the channels that made the least use of these possibilities. However, there are several techniques to overcome the limitations of e-mail. 90% of the information transmitted to a man’s brain rom what he sees. Marketers have known this for a long time and have always favoured visual content, always using the resources available at that time. From now on, online video, is big, and that is where things happen. 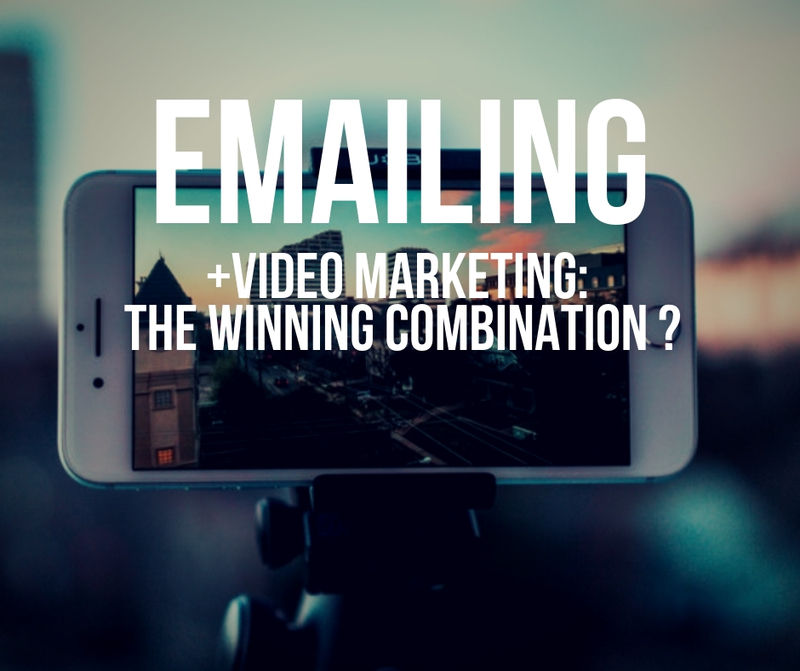 While the potential of video storytelling marketing on social networks, websites and video platforms is well recognized, there is still one area in which video remains a challenging field: e-mail marketing. Studies show that by simply adding the word “video” in the subject line of an e-mail, the opening rate jumps to 19%. And adding video content to an e-mailing strategy can increase the overall click rate by more than 300%. However, most email providers do not allow you to add embedded videos. To get around this, there are several techniques, which we have detailed below. Brands frequently include the latest news in their e-mail marketing strategy. This is a proven tactic: regularly providing the latest information keeps you connected to your audience while keeping them informed about the brand’s activity. But even if you subscribe to best practices and send newsletters on average once a month (on a regular basis but not too often either), you will still miss this little dynamic touch. To remedy this, it is therefore recommended to add video to your emails. We can call it video information, or “vNews”. Thus, the video hosting company Wistia added video to its marketing emails and found 40% more engagement compared to an email without video. As mentioned earlier, it will not be easy to integrate a video directly into the email, but it is always possible to add thumbnails of your videos, as Wistia has done. You can also add screenshots, gifs, or even links to the original video. It is always better to “show, rather than tell”. Thus, no matter how much you send an e-mail to a whole list of prospects to promote the merits of a product or service, it will always be more effective to show them. This can be done by adding short explanatory videos on how the product or service works, using attractive animations, colours and graphics – anything that can capture the audience’s attention. Showing an overview of the latest news is a great way to create a buzz about what’s new. To go further, do not hesitate to show the product or service in action through video to generate even more interest among the target audience. A key point is to share videos translated into the language of your audience. Eventually, only a small portion of web users speak English fluently, and unless your video is not subtitled, they will not understand it. If you opt for adding voice over, that will result in additional proximity and more possibilities to sell abroad. Multilingual videos will definitely help you in targeting foreign customers with emailing. One of the main aspects of event marketing is the follow-up of the contacts made. If your company participates in an exhibition or conference, and if was a success for the company , this dynamic must be maintained after the event. It should not be forgotten that 87% of customers purchased a product or service following an event at a later date. But instead of sending a standard thank you message, it is possible to stand out by incorporating a video. Do not hesitate to record a few video sequences during the event to group them into a small condensed video clip of a few seconds to summarize the highlights or key figures. HubSpot, a provider of inbound marketing solutions, has highlighted the link between the use of video in commercial emails and higher opening rates. This makes it possible to customize marketing emails. Do not hesitate to take video rushs of collaborators in discussion with prospects on the booth or at the event to add these sequences to the video. This will make the content accessible and user-friendly, and will create trust in the brand. As marketers, we communicate a lot about the advantages for potential customers to use our company’s solution, often insisting that it will accelerate efficiency and productivity. But some potential customers may be lost along the way. If this is the case, sending a long document such as a FAQ or white paper will certainly not be enough to raise their awareness and interest. On the other hand, adding tutorial videos or FAQs videos to emails is ideal because, as mentioned above, most people have a visual memory. In addition to this, prospects generally do not plan to spend an hour of their (already busy) day reading a white paper. Thus, by creating a quick tutorial yourself, we can easily attract their attention visually, but above all it will avoid them a tedious reading. Instead, they will just have to watch the information scrolling through the video. With all these ideas for adding videos to e-mail content, there’s no excuse for not getting started. All that remains is to give free rein to your creativity and establish a real proximity with readers thanks to adapted tools, allowing you to develop your video storytelling easily and efficiently. How to use online presence to grow your exports?